This is the basic recipe I use. The coconut milk gives this simple curry a great depth of flavour and adds an appealing edge of sweetness that mellows out the hotter flavours. Serves four to six. In a large saucepan, warm the oil over a medium heat and sweat the onions with a pinch of salt until they soften and turn golden – about 15 minutes. Add the garlic, chillies and ginger, and fry for a couple of minutes. Stir in the curry powder, cook for a minute, add the coconut milk, lentils and stock, season and leave to simmer for 15 minutes. Put the eggs in a pan of warm water, bring to a simmer and cook for five minutes. Drain, put them in a bowl of cold water for a couple of minutes, then peel. 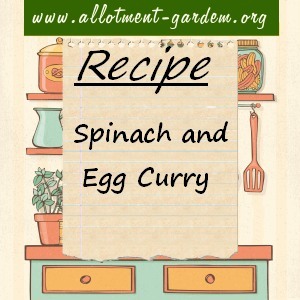 Add the eggs and spinach to the curry – put on the lid for the first minute, to encourage the spinach to wilt – and simmer gently for five minutes. Stir in the lemon juice and half the chopped coriander, and adjust the seasoning if necessary. Heat for only as long as it takes to warm the eggs through. Top with the rest of the coriander and toasted almonds, and serve with basmati rice.